As children, most of us were taught that Christmas is a time of joy and happiness. As adults, we know that for many people, the exact opposite is true. That’s why, as individuals, we reach out to friends and family - and to strangers - who we know are in special need this time of year due to illness or sorrow. The same way, KNOM “decorates” our signal with Christmastime spots, hymns, carols and special entertaining and inspirational stories this month. 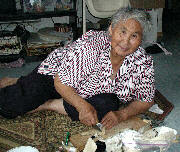 Of course, we maintain our daily fare of news, education and inspiration, a beacon throughout winter-dark western Alaska. Thank you so much for brightening Christmas throughout western Alaska. 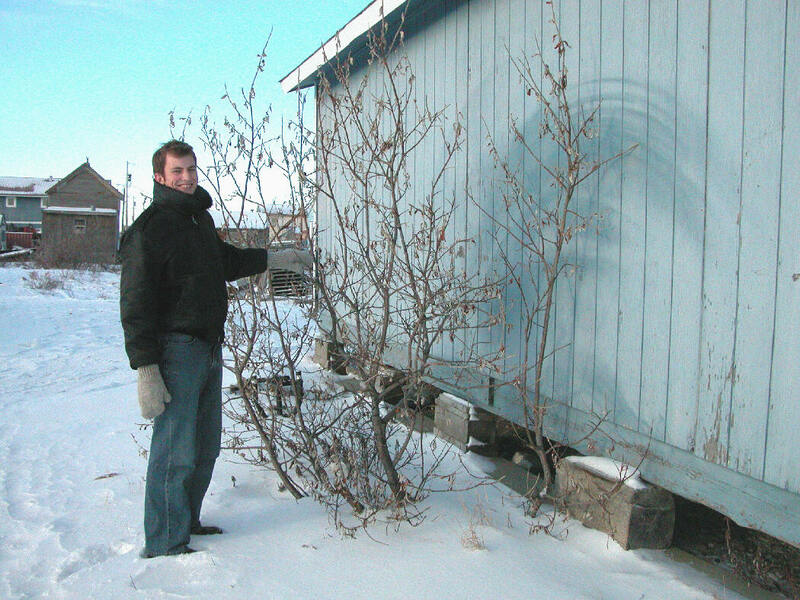 A-HUNTING WE WILL GO: (left) When KNOM volunteer Jesse Zink went looking for a Christmas tree for the radio station, he didn’t have far to go, finding these magnificent little willow bushes behind KNOM’s storage shed. For the last several years, we’ve harvested “trees” like this, which grow almost like weeds on the tundra. Jesse looks surprisingly warm. As this photo was taken the second week of November, the wind chill was about -15°. Ric is vice-chair of Alaska’s Employer Support of the Guard and Reserve and helps support families of National Guard soldiers who have been deployed in Iraq. Ric received the honor in front of hundreds of his peers at the Alaska Broadcasters Association convention in Anchorage. KNOM is the oldest Catholic radio station in the United States, beaming into thousands of homes throughout 100,000 square miles of road-less, remote western Alaska. Our work is made possible by the generosity of good people like you. 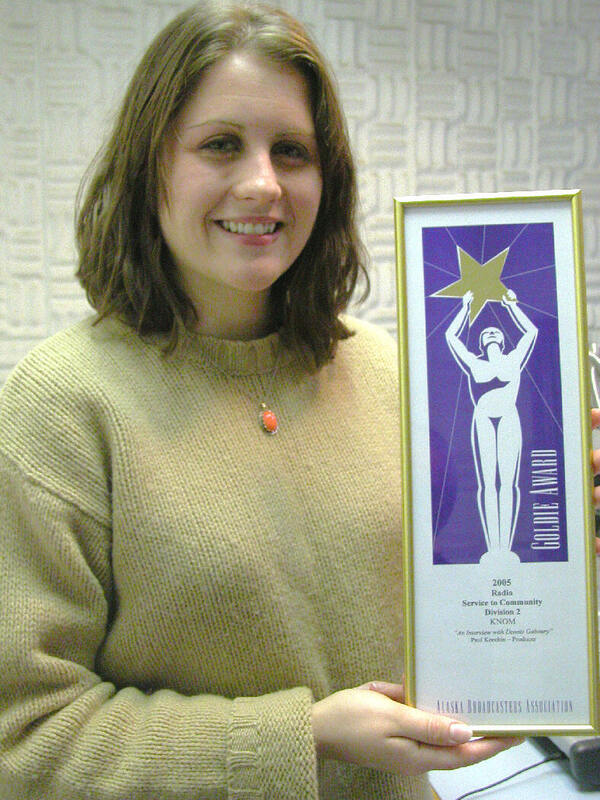 GOLDEN: (left ) KNOM public affairs director Amy Flaherty holds KNOM’s “Best Service to the Community” Goldie Award from the Alaska Broadcasters Association. The station was also honored for “Best Live Event Coverage” for Paul Korchin’s lifesaving reports during Nome’s October 2004 flood. NOT FOR THE BIRDS: It may come as a surprise that KNOM is abuzz with news of avian flu. That’s because thousands of birds from Asia, aiming for northern Russia, miss their targets and wind up in western Alaska. In fact, thousands of bird watchers travel here to see them. Birds and bird eggs are a significant source of food for villagers, especially along the coast. The fear is that our region may encounter bird flu early, contaminating this important source of nutrition. Meanwhile, University of Alaska scientists have tested many birds in the region, and plan to test many more next spring. KNOM has broadcast many news stories on the subject, and it was the topic of a spirited call-in program. WE HAVE ISSUES: Among subjects we covered this past month are Native American-named team mascots, the high cost of living in Alaska’s bush, teenage pregnancies and government policies concerning people with disabilities. One program featured U.S. Attorney for Alaska Tim Burgess, who has been nominated for a federal judgeship. Burgess is trying to prevent rural Alaskan use of methamphetamine, which is just creeping into villages. Thank you for supporting these valuable programs! SNOW BUSINESS: We couldn’t exactly remember, so we asked Jerry Steiger, chief meteorologist with the National Weather Service in Nome. According to Jerry, KNOM’s first broadcast of a winter storm warning this season would have been on October 16th. THE LONG AND SHORT OF IT: Between December 15th and the 26th, Nome will see less than four hours of sunlight a day. At high noon, a 6-foot person will cast a shadow 166 feet long! Please consider adding KNOM to your will. For many years, we have kept our promise that we place all bequests into funds that provide for major improvements to the mission, or which protect the mission during emergencies. CHRISTMAS INSPIRATIONAL SPOT: There must be someone to whom I could reach out, someone whose life I can bring a little Christmas joy. Not just family or friends - someone else will be remembering. It would be a nice Christmas gift for Our Lord on His birthday. 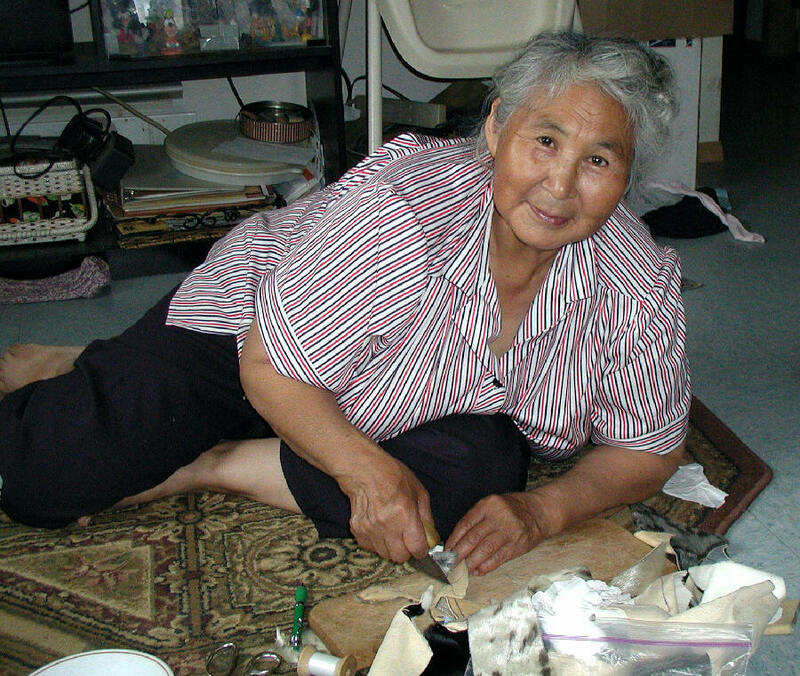 SEW-SEW: (left) In the village of Brevig Mission, KNOM listener Rita Olanna fashions a Christmas angel ornament from seal skin. 65 miles northwest of Nome, KNOM’s Amy Flaherty was in the village to record Rita’s thoughts for an upcoming “Elder Voices” program. STOCK ANSWERS: Many of our friends choose to give by means of stocks or bonds. These can be assigned to "Catholic Bishop of Northern Alaska #5," account number 2003-7336, Ragen McKenzie, Inc., attention Krista Stamper. Please notify KNOM general manager Ric Schmidt of the gift to ensure that it is credited to KNOM. Thank you for your kindness! THIRTY YEARS AGO: In December 1975, Nome’s temperature bottoms out at -39°. TWENTY YEARS AGO: Led by Linda Raab, several volunteers ambitiously start work on an authentic snow block igloo in December 1985. It’s about three-quarters finished when a blizzard fills it in and drifts completely cover it. TEN YEARS AGO: December 10, 1995, Lynette Schmidt and the six Schmidt children, one unborn, join husband/father new program director Ric in Nome. Lynette becomes KNOM’s inspiration director on a part-time basis, supervising production of the station’s inspirational spots. remember that just as Jesus the Christ is God’s Gift to us, we can make our celebration of His birth a gift to God. CHRISTMAS INSPIRATIONAL SPOT: Born in a stable. A choice He made. Simplicity and poverty. A choice no temporal power or influence would have ever suggested. A choice - God became man in a way no one would have ever guessed. Do you suppose He was trying to tell us something? WHAT A GUY! (left) From Grass Valley, CA, former KNOM engineer Les Brown flew up for a week of volunteering, patching headphones, checking the emergency generators, and here, examining KNOM’s guy wires during a quarterly tower inspection. REASSURING: Volunteer Liz Recchia spoke of a telephone call at 2:30 AM during the brutal storm that tore the siding off the KNOM studio. It was from a woman who was troubled by the howling noises outside, and the debris flying past her bedroom window. 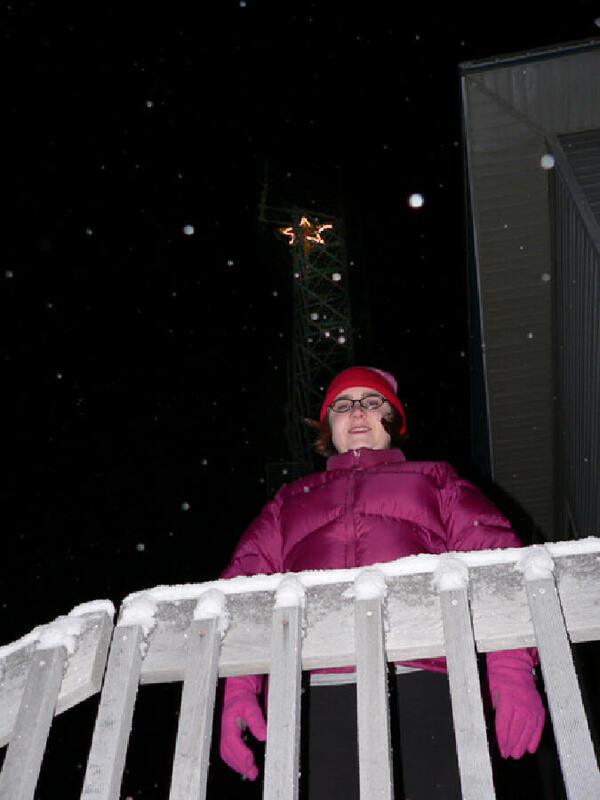 WEB EXTRA: NOT SO FALLEN STAR: A casualty of that massive autumn storm was the KNOM Christmas Star. At 85 feet above ground, atop the studio tower, it appears to have been hit by debris. We thought this would be the first time since 1970 that a lighted KNOM star will not herald the birth of Our Savior in December. However, in mid-month volunteers Liz Recchia (left) and Eric Guthier discovered that while the torn lights cause the star to "look like heck" in the words of general manager Ric Schmidt, perhaps a tattered star is better than none. Nomeites had commented on its absence this year, and it appears that everyone in town is happy that even a broken star's reminder of the Nativity. TRAVELS: Amy Flaherty was off to the “big” city of Fairbanks to cover the Alaska Federation of Natives annual convention. Amy produced interviews and fed several live reports each day. 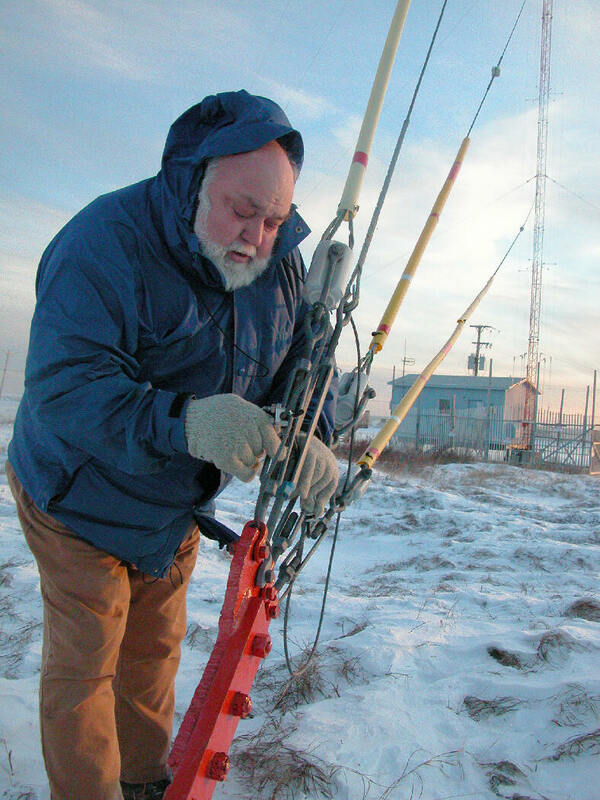 For Paul Korchin, it was 180 miles north to Kotzebue, to cover a six-week murder trial. Moved to Kotzebue after the first trial in Nome resulted in a hung jury, it has gathered more controversy than any trial in memory. Paul came home weekends, but his weekday absence put an extra burden onto everyone, especially volunteer news reporter Jesse Zink and Amy, after her return from Fairbanks. Paul took an incredibly deserved week off for Thanksgiving, and was spelled in Kotzebue by Amy. There were no complaints, just lots of patience and cooperation. Meanwhile, most everyone in the region tuned in for reports from Unalakleet (YOO-nah-lah-kleet, 146 miles east of Nome) by volunteer Eric Guthier. They were hearing news of their children and grandchildren who were competing in wrestling and cheerleading tournaments. Thank you again, ever so much. As always, we will be praying for you this holiday season. May God bless you abundantly for your generosity and prayers and may your Christmas be blessed.